A vacation to the Northern Cape would not be complete without a deviation from the planned itinerary – especially if it doesn’t include The Big Hole. At one point in time, it was actually a hill with a flat top. Today, this hole is a whopping 705 feet deep. Its surface area is roughly 42 acres, with a perimeter just shy of a mile. 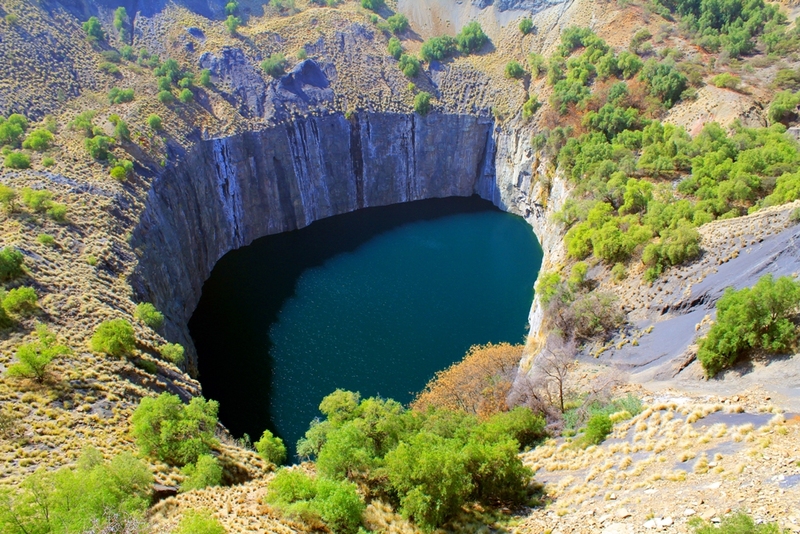 If it were a natural wonder, it would still be amazing; however, The Big Hole of Kimberley is entirely made by man, and is the largest excavation project in the entire world to be hand-dug. It began innocently enough in the mid-1860s, when Erasmus Jacobs found a shiny stone on the banks of the Orange River. This shiny stone was later sold in England for five hundred pounds – after it was determined the stone was in fact a diamond; a diamond over 20 carats in total weight. After two more similar stones were found, the rush was on. This once flat hill disappeared in a frenzy of miners, desperate to get their chunk of the payload, which ended up yielding nearly 3,000 kilograms of a girl’s best friend. The underground portion of Kimberley’s mine reaches nearly 3,600 feet into the ground. The mining operations underground have recently ceased, investors deciding it’s time to turn The Big Hole into an experience for tourists. You can now visit the depths of the Hole in a recreated mineshaft, watch a video that will introduce you to Kimberley’s diamonds, and more. There is now an upper platform from which you can take in the Hole in its entirety, and even a replica of Old Town Kimberley, illustrating what it was like in the heyday of this mining town. There is a museum complete with various shops, houses, a tavern, and even a church. De Beers Hall illustrates some of the uncut diamond finds found at Kimberley, as well as jewelry made from stones found here. There is also on display the largest diamond in the world to remain uncut, at 616 carats, as well as the first diamond ever to be discovered in the region.